Mass gainers are excellent for those of you that are currently underweight, but they should not be taken lightly. If you are looking to build muscle but don’t mind a bit of body fat accretion then these are the products for you, just remember that you need to increase your exercise to match this. Below we are going to examine ten of the best mass gainers that are out now, we will take a brief look at the company, the product, the ingredients, and the advertised benefits, and review them based on that. As always Optimum Nutrition are in the top ten, probably the most consistently reliable company out there, Optimum Nutrition have got an excellent Mass Gaining supplement for you with the Optimum Nutrition Gold Standard Gainer. Each serving (2 scoops) contains 770 calories, 55g of protein, 110g of carbohydrates, and 11g of fat. The protein is mostly from isolates, but it is a mix so will be partly made from concentrate. The carbohydrate sources are oats, peas, and potatoes. Whilst the fat comes from chia seeds, flaxseed, and MCTs (usually found in coconut oil). There are four flavors available: Cinnamon Bun, Colossal Chocolate, Cookies & Cream, and Vanilla Ice Cream. This product will seriously help you to maximize your recovery and results after a high-intensity weight training session. MTS Nutrition have tried to do something unique here with Epic Gains, creating a lean mass gainer. So whilst the other mass gainers out there are focused on high calories whatever the cost, MTS are trying to prevent fat gain. So a serving of MTS Epic gains is much lower calorie (296), whilst still containing a decent level of carbohydrates (36g of brown rice based carbohydrates). The protein is a little on the low side at only 20g, but remember that two scoops would still be fewer calories than either Optimum Nutrition Gold Standard Gainer or Isopure Mass at only 592 calories with 40g of protein. 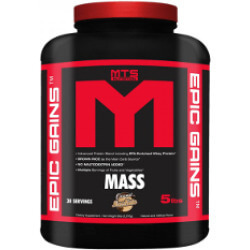 MTS’ Epic Gains is a great choice for someone looking to build a bit of muscle, but trying to keep body fat low. Nature’s best Isopure range is well known for being of excellent quality. They have low carb, no carb, and regular carb protein shakes, and they also have the Isopure Mass that is definitely high carb! Each serving (6 scoops) contains 600 calories, 86g of carbohydrates, 53g of protein, and 5g of fat. Out of those 86g of carbs only 3g are sugar and 4g are fiber. 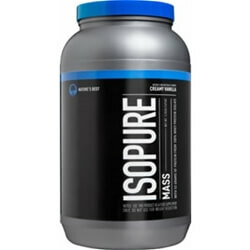 What’s nice about Isopure Mass is that it has roughly the same amount of protein as Optimum Nutrition Gold Standard Gainer but is 170 calories less. This shake is better suited to people who are looking to build muscle with minimum fat gain, while Optimum Nutrition have created a mass gainer for people who need to gain a lot of muscle and don’t mind as much about the fat. While the last supplement we looked at was aimed at people trying to build muscle without any fat gain, Dymatize Super Mass Gainer could not be any different. This supplement is aimed at people who want to gain as much muscle as possible in as fast a time as possible, who will deal with fat build up later. 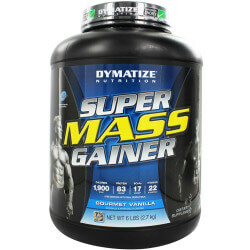 If you are the classic “Hard Gainer” then Dymatize Super Mass Gainer may be the answer to your prayers. Each serving contains 1300 calories! There are 52g of protein in each serving so the majority of these calories come from carbohydrates of which there are 254g per serving. This is huge. This is more carbohydrates in one serving of a supplement than most people get in their diet full stop. Whilst fiber is quite low at 5g, the fat content is also relatively low (10g per serving) meaning that you should still have a lot of flexibility in your diet afterward. The protein comes from a combination of sources: egg protein, whey concentrate, whey isolate, whey hydrolysate, and casein protein. The shake is also absolutely packed with vitamins and minerals, something that a lot of mass gainers neglect. We’ve already looked at an Optimum Nutrition Mass gainer with our first entry, and whilst “Serious Mass” comes from the same company, it couldn’t be any different. 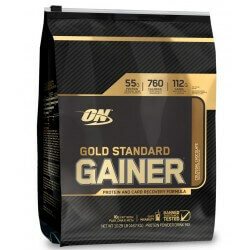 Whereas Gold Standard Gainer contained 770 calories per serving Mass Gainer contains 1259. 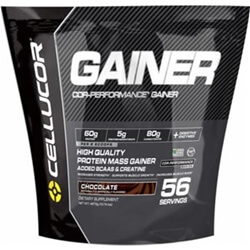 Mass Gainer actually has 5g less of protein per serving, but it has 142g more carbohydrates! That’s more than double the serving (252g compared to 110g). There is also only half the fat content with 5.3g per serving rather than 11g. 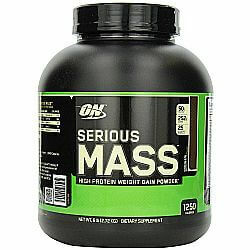 Optimum Nutrition Serious Mass also has 25 vitamins and minerals, Creatine, and Glutamine contained in each serving. As always with Optimum Nutrition, there is a variety of fantastic flavors available. 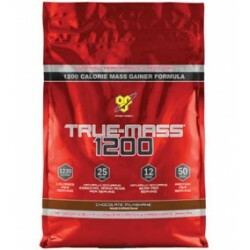 True Mass 1200 by BSN is an excellent mass gainer that has constantly had a high rating on many supplement websites (including bodybuilding.com). There are 1220 calories per serving, 54g of protein (multiple sources), 212g of carbohydrates, and 16g of fat. True Mass has 25g of naturally occurring essential amino acids in each serving. This supplement is exceptionally well designed to help you build huge muscles. MyProtein took the supplement world by what by storm. Direct to consumer model, aggressive social media sponsorships and more than anything else value for money! MYPROTEIN products regularly win Labdoor testing awards for quality and value. Extreme Gainer is another example of this. Living to the MYPROTEIN promise, Extreme Gainer is yet another great value for money offering, extending the immensely popular Impact Whey Protein by the company. 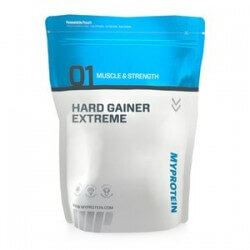 Extreme Gainer contains 35g of protein per serving, 62g of carbs, and 7.8g of fat. It also contains 5g of Glutamine and 5g of Creatine, which makes this a fantastic post-workout supplement in its own right. With 840 calories per serving, 63g of protein, 132g of carbohydrates, 10g of creatine, and 7g of fat, Mass Tech is a very well balanced mass gainer. The carbohydrates come from multiple sources (millet, quinoa, buckwheat, and oat bran) as does the protein (egg, whey concentrate, whey isolate, whey hydrolysate). Five grams out of nine grams of fats are omega-rich, which is very decent. This is a great mass builder for those of you who want to build a little bit of muscle but are worried about gaining too much fat. The protein per serving is absolutely massive, whilst carbohydrates are medium and fat is relatively low. The creatine is quite high but is still within your daily limits, but just pay attention to your body. You might benefit from dropping to 2-3 scoops rather than 5 to keep creatine to 5g per day. Cellucor’s mass gaining supplement is a little different to the others on this list. Whilst most have a high carbohydrate to protein mix (usually 3 or 4:1 parts) Cor-Performance Gainer has 60g of protein and only 80g of carbohydrates. It also contains 5g of creatine. There are only 340 calories in each serving, and as a result, Cor-Performance Gainer would work well as a pre-workout (most others would be way too heavy for this). Musclepharm have a decent reputation as a company that takes their supplements seriously. For instance, their researchers have “performed over 20 clinical, university, & independent studies” on their products. They are also proud to say that they go “above and beyond” what is expected of them as an industry. The mass gainer itself is a 1270 calorie mass gainer with 50g of protein (whey concentrate, whey hydrolysate, and casein blend), 252g of carbohydrates, and only 7g of fat. 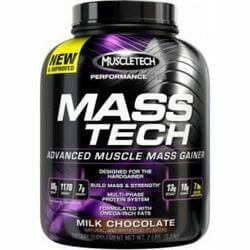 This is an excellent and reliable mass gainer that would be perfect taken as a pre-workout or just before bed. The very reasonable price makes it excellent value too! 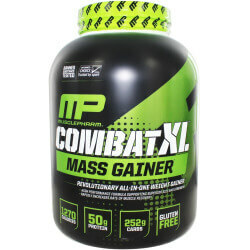 See the hottest Mass Gainers Deals from around the web!